Finally we have the results of this years Euro Micro Championship. After 10 regattas, including the World Championship in Swinoujscie, the ranking in all 3 divisions is here. This year we had 24 boats in the ranking. Here you can find the official Euro Micro 2018 results. France, Germany, Italy, Poland, Slovakia and Russia. The 3 years mandate has reached their end; any resignation has been recorded, all board members confirm they are candidate. After have consulted all present, vote with no against or abstention, all members are recon ducted and confirmed (see list attached). Marco d’Alba (Italy Micro Class President) is proposed by Ph Benaben to be elected as Vice President; by vote of all presents this election is confirmed. Two new measurer have been nominated: Lukasz Paszko for Poland and Mario Fagoto for Italy Mike Vvedenski to resign. Manfred Bauendahl suggests nominating a further person as Chief Executive Officer to work with World Sailing Technical Specialist Hendrik Plate. Philippe Bonnemains, French National Measurer has accepted to be the Chief Executive Officer for IMCCA and his nomination will be announced to World Sailing. Mike Vvedenski to send his report shortly. It is requested all countries to send by end of November 2018 final end of year report for sending annual Micro Class report to World Sailing. Countries hosting Euro Micro legs will have to send by October 31 proposed dates for 2019. During November all issues regarding dates will be sorted out and final 2019 calendar will be published by November 30th. Mike Kelemen to present place and facilities of WC 2019 in Slovakia (see attached presentation). Positive points are highlighted: all facilities as car and trailer parking, accommodation, camping, measurement … are on site close to the berths and club building. Next year IMCCA GA 2019 is scheduled on Saturday August 17 afternoon in Slovakia before the 2019 WC. Boat renting has to be addressed, if oversea competitors wish to participate; Russia said they can offer some boats for renting. 9 countries and 2 continents : We have make the minimum required by World Sailing to ensure that the IMCCA remain a World Sailing recognised class. This is a good news and an important achievement for the continuity of the class. The results are still to be send to world sailing. We didn’t have the support from the Federation to do it. The ranking is late, due to the lack of time and the organisers do not send the results. For 2018, Regis Mitonneau will take the responsibility of the web site, and calculate the EuroMicro results. For 2018 Régis will issue an Excel format to collect easily the results. The format will include World Sailing Sailor ID for competitor to simplified. (Nota : this ID is provided by World Sailing free of charge). Philippe Benaben will contact the countries who didn’t pay the IMCCA fees. The change of format of the class rules is voted. The new class rules will be in SCR format, with no changes in the content. SCR is the standardise format défined by World Sailing. Poland as a completely new class organisation. France : major changes in the class board. Czechia : there is now 2 boats sailing. UK : there is a fleet of 15 boat. They organise their major regatta 29 and 30 septembre. But the sailing area has low water with the tyde and the boat as diverge from IMCCA class rules. Greece : there are some boats. Slovakian team present the progress of the organisation and the details for the venue. Poland present a complete project. The project is linked with the 100 anniversary of the wending of Poland and the sea. Russian project is not advanced and can be changed to another year. The 2020 WC will be in Poland, in Gdansk. 2022 : Germany say that they are candidate. Physical meeting in winter are expensive and with poor efficiency. A meeting with people physically present and the other via Skype is a bad experience. The next IMCCA meeting will be during 2018 WC, the saturday during measurement. Web site will be open soon, with the NOR, inscription and accommodation options. There is plenty accommodation options, from luxury hotel to free camping on the marina. Booking must be done early, Świnoujście is a busy holiday place. Sailing area : the sailing area is the Baltic sea. If there are to strong wind and waves, it’s possible to sail in the lagoon in the south of the city. Security : the VHF is recommended. The IMCCA board warm the organizer not to give information in polish who may advantage polish speaking sailor. Inscription fee are 275€, if registration before 30 April. Measurement : like any WC, measurement is only a control. The sails without official stamps with be measure with a fee of 25€ per sails. Today 69 boats have registered , one third coming outside of France , on a total of 8 countries and two continents , and specially coming : a high motivated crew from Argentina. 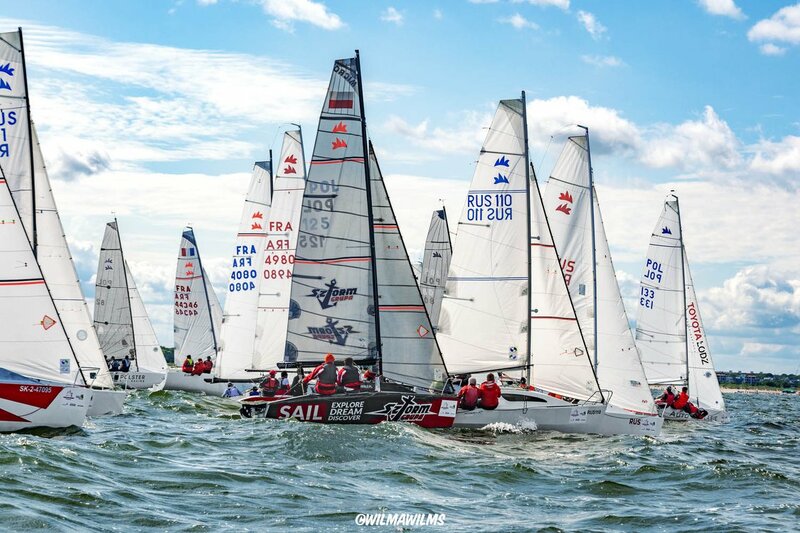 Only 26 boats among that fleet of 69 were participating at WC in Brest in 2015, which demonstrate that Micro fleet is renewing, with new boats and crews. This top participation is challenging SRVA , the organizing club which due to limited capacity for mooring boats and parking will have to limit entry list at 70 boats . Boats registered above 70 will be put on a waiting list; these will be announced within a few days through official channel. Sociéte des Regates d’Annecy /SRVA and organization committee thank all boats which have already registered and will welcome them with great pleasure in Annecy. Dear Micro community, we are waiting for your in Annecy, and don’t hesitate to contact us for any question.